On Monday President Obama nominated his counterterrorism chief, John O. Brennan, to head the Central Intelligence Agency. Though some civil liberties groups and other critics have raised questions about Brennan’s involvement in the CIA’s practice of torture during the Bush administration, relatively less has been said about his primarily responsibility during President Obama’s first term: accelerating and institutionalizing the U.S. drones program and its “disposition matrix” — as the government’s sanitizing parlance puts it — which has included setting weekly drone kill lists. Politicians and the mainstream press have generally reacted warmly to Brennan’s nomination, especially in contrast to President Obama’s choice for Secretary of Defense, former Senator Chuck Hagel, who is considered suspect by some in the foreign policy establishment because he opposed the Iraq War and is said to harbor anti-war sentiments rooted in his service during the Vietnam War. While we will have to wait to see if Hagel’s reluctance to take the U.S. into war pans out, there is no doubt about Brennan’s trajectory. As a Washington Post series last October highlighted (which I commented on here), Brennan has created a powerful new system that fuses drone technology, satellite surveillance and massive databases to target and kill persons of interest globally, with the capacity to cross borders at will. An international law expert at the University of Notre Dame, Mary Ellen O’Connell, has urged the Senate to vote against Brennan on the grounds that the drone program is among “the most highly unlawful and immoral practices the United States has ever undertaken.” By tapping Brennan to direct the CIA, President Obama has signaled his commitment to an expanded role for remote warfare, targeted assassinations, comprehensive surveillance and an even greater projection and reach of U.S. military power. That’s why what took place in a courtroom in California the day after Brennan’s nomination is significant. This small but significant action was part of a growing movement intent on alerting, educating and mobilizing the public to take stock of — and reject — the new world of remote control surveillance and control that is rapidly coming into being. This movement recognizes that the United States has crossed a line by institutionalizing drone-centric warfare and, even more ominously, is well on its way to creating a global culture in which remote aircraft will be as natural as the air we breathe. Brennan’s likely ascension to the job of the nation’s top spymaster and covert operations czar — especially in a period when the CIA has been fielding its own drones operation — makes this more likely than ever. A drones culture is a chilling prospect. It promises to dramatically escalate a trend that the United States has been pursuing since the inception of the national security state in the late 1940s: military superiority through surveillance — beginning with U-2 flights, the SR-71 Blackbird and the NAV-STAR satellite system — and land-, sea- and air-based weapons systems. Its logic is to establish a regime of incontestable control and to create a comprehensive, remote and automated war-fighting capability. This has profound geopolitical implications. But it also threatens something even more monumental: the increasing depersonalization and dehumanization not only of warfare but, more generally, of social organization and interaction. The terror of the Atomic Age was the potential for the annihilation of life in a matter of hours or days after a nuclear exchange. The terror of the Drone Age is living under systems of control over the course of one’s whole life. Such a regime could operationalize — and give factual bite to — George W. Bush’s pithy declaration, “You are either with us or against us.” The disposition matrix of the near future will have the capacity to more and more finely divide us into “us” and “them.” What is being worked out today over the skies of Pakistan, Afghanistan and Yemen — with all of its attendant horror and bloodshed on the ground — will likely be applied far and wide. All of this will be deemed “legal.” And, if allowed to proceed unhindered, will eventually pass largely out of the hands of human minders. But that’s inherent in its logic. Drones carry on the radical detachment between cause and effect that high-altitude bombers introduced during the Spanish Civil War and World War II. With the horror unseen, one could increasingly accelerate the age-old tactic of dehumanizing the opponent. In the Drone Age, the ultimate dream is to hand this task entirely off to software so that no humans fingerprints are even found on the human wreckage it leaves in its path. But there are still fingerprints — and that may be part of our salvation. My colleague Friar Louie Vitale (one of those arrested but not charged at Beale) has been part of the anti-drones movement for several years. He recently told me about a time he was vigiling at a major drones base as the employees were headed home for the day. While he stood there with a sign, a man on a motorcycle pulled over to chat. He said he was a captain who had flown a lot of missions, and now was “flying” drones sitting at a monitor with a joystick. He spoke matter-of-factly about conducting these operations. Nothing unnerved him about what he was doing, he said — except when what he called CIV CAVS (“civilian casualties”) were involved. When that happens, he told Louie, he couldn’t sleep. Do those who order these attacks sleep at night? For that matter, do we? The drone system is designed to keep our sleep untroubled. But there are some among us who have decided to wake up, like the five going to court in April, and to in turn invite us to do the same. What if more of us wiped the sleep from our eyes and decided that we will do everything in our power to pull back from the horrific terrain we have let our policy-makers enter? It is time to deepen and broaden this movement for human rights. We could become part of Drone Watch or Code Pink. We could read Medea Benjamin’s book, Drone Warfare: Killing by Remote Control. We could put ending the “disposition matrix” on the agenda of our organizations. We could ask our religious communities to spend some of their moral capital in standing for a more ethical future, including signing onto “A Call from the Faith-Based Community to Stop Drone Killings.” We could take action like the Beale Five — who will face a maximum sentence of six months in jail and a $5,000 fine when they head to trial in April — or like Brian Terrell, who is currently serving a prison sentence for nonviolently resisting drones. There are likely many local connections, which could be the basis of a nationwide campaign to help the nation make a decision for a world free of drones and the dehumanizing culture they portend. 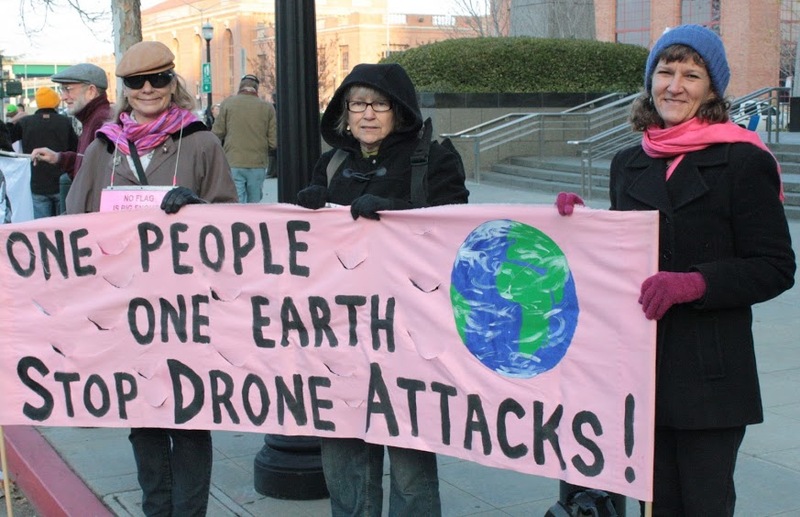 Joanie Connors Drones are killing hundreds of civilians, women and children. Don’t measure a people by its leaders, otherwise, we’d be dirt! As Ken says, our nation is at a critical juncture – whether to go the direction of proliferating Drones around the world or stop this madness NOW. Please join us in helping stop all DRONES NOW! Thank you, David. Keep us posted on the process of your case! Ken, congratulations on the article. You are so right; this madness must be stopped, before it gets so routine that it will be nearly impossible. Let’s weave it into our projects and use it as a benchmark; maybe this is where the war system begins to unravel. This piece is a concise, clear, moral imperative. So, why do people like John Brennan and Leon Panetta, both Jesuit educated in Just War Theory (if anyone still believes in such nonsense) break every tenet of this Medieval Rule (hundreds of years older than the antiquated Second Amendment to the US Constitution). Americans as a people honor and applaud killing those designated as “enemy” by our government. We need more people like WWI unsung hero, Ben Salmon, and WWII hero, Franz Jagerstatter. Some Americans are not standing back. Ask Brian Terrell now in federal prison for trying to deliver a war crimes indictment to a drone base in Missouri. We used to say “civil disobedience”, so it’s good that Ken Butigan noted Civil Resistance. There is no disobedience involved in resisting United States Government assassinations. Assassination is illegal and has been since Pres. Gerald Ford issued his executive order making it illegal in 1976. (Order 11905, Section 5 (g). However, since immorality apparently is not even a concern in drone killings, one can understand why illegality is swept under the rug by Mr Obama and Mr Brennan. I agree with all the sentiments in this article. However, drones are here to stay. Its the sad reality and anybody who thinks that we can wholly reverse this trend is fooling themselves. I’m not saying do nothing, but if you look at all the issues related to the usage of drones, there longevity is all but ensured. Ken, we obviously can’t stop at trying to stop drone strikes. We’ve got to get rid of the entire war-national security, industrial, political triumvirate, the most poweful and deadly part of the powerful corpocracy. Elsewhere I have outlined several initiatives for stopping all military interventions, including drone strikes: petitions; protests; proxy initiatives; more aggressive initiatives prosecution, conviction and punishment and civil revolution) plus several other initiatives such as targeting the members of Congress on incluential committees and serving districts having defense contractor installations. America’s history has been a checkered one to say the least. She has had her finer times but they are eclipsed by her worst times of domestic and foreign exploitation and brutality. We are living and suffering through one of those prolonged worse times. The odds against turning America into a peace loving and practicing nation are astronomical. So are the odds against winning the lottery, but there are eventual winners. We need to buy into a lottery for a better America where peace always wins and war is never an option; an America with social and economic justice; with universal health care; with thriving small businesses and cooperatives; with a right to join a union and to bargain; with healthy and safe products and services, and with sustainable growth and a sustainable environment. I’m not talking utopia here. There are a few countries in the world, the Scandinavian ones mostly, that could serve as models for a future America. Mention those countries and the kneejerk reaction of many is to cry “socialism.” To them I say “shut up” and read what I say about democratic capitalism in contrast to undemocratic capitalism. Obviously we can’t leave America’s destiny up to a lottery anymore than we can let her current conduct and destiny be up to the deadly monster. So let’s put the “we” full force into organizing and launching democracy power. If we do not try what does that tell the subjugated world about us? Poet Dante reserved the worst inferno for people who don’t try. I’m not going there.